The Pilates class I would run initially as a course of 6wks so that it is a great opportunity for those new to Pilates, wanting a good kick start to improving core and posture, focusing on specific weaknesses or for those simply wanting a small group. Starting date to be confirmed 2018. Fitsteps – designed by ‘Strictly Come Dancing’ Stars Natalie Lowe & Ian Waite. I am so excited to bring Fitsteps to Rooftop Studios a fun & fantastic Adult dance fitness class. An upbeat dance workout, mixing graceful steps of Ballroom and the up-tempo steps of Latin dances. No partner needed. Suitable for all fitness levels and dance experience. 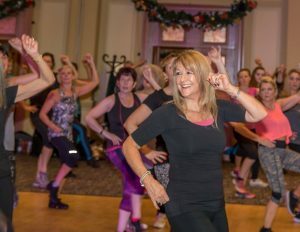 Over the first 6 wks I will cover all the basic steps required through the many Ballroom and Latin dances, look at technique’s which will provide a sound foundation and make for a great workout. Hi Michelle thank you for your message. Unfortunately I have yet to bring any of my classes to Stone (I currently teach all classes in Stoke on Trent) my nearest class to Stone would be at the Michelin (ST4 6NL) – I teach a Yogalates class here (mix of yoga & pilates). Since I replied to your comment I am now looking at starting up a beginners Pilates in Yarnfield on a monday – morning/afternoon, to start in Feb.